The evening before the first, and likely only, debate in the race for governor of California, Neel Kashkari released a mini documentary film attacking Jerry Brown for his ties to the California Teacher’s Association (CTA) and blasting him for his decision to appeal a case which Kashkari posits shows Brown’s commitment to unions and organized labor over the welfare of children, particularly minorities. “I want to tell you about a sad chapter in California’s history. It began 40 years ago when Jerry Brown was first governor, and he first made a deal with the CTA,” are Kashkari’s opening lines in the video. Kashkari’s video arrives just five days after Brown appealed a Los Angeles Superior Court ruling in the Vergara v. California case which found that California’s disproportionate teacher tenure rules deprive students from receiving their constitutionally-prescribed right to quality education by keeping “grossly incompetent” and inferior teachers in classrooms. “Jerry Brown and the teachers union: 40 years of violating the civil rights of poor and minority kids,” is written across the screen at one point in the mini documentary. 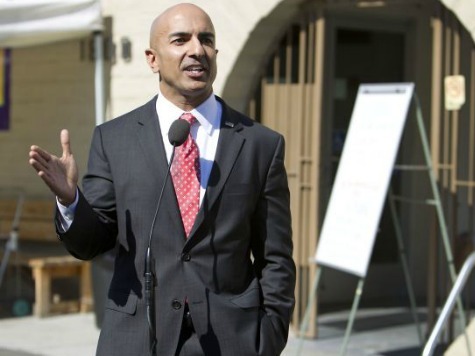 Kashkari, who has pushed education reform as one of his core campaign messages, dates Brown’s close-knit relationship with the CTA back to when Brown was first governor from 1975 to 1983. It was in 1975 that Brown signed the CTA-sponsored Senate Bill 160 by then Senator Al Rodda which later became known as the Rodda Act (also known as the Educational Employment Relations Act). The Rodda Act of 1975 mandated that schools engage in collective bargaining, essentially opening the doors to negotiations over the quality of education provided. Kashkari points out in his video that “in 2010, the CTA coordinated more than $7 million in campaign contributions for Jerry Brown” to help him get reelected. Brown has avoided discussing the Vergara case and his campaign has reportedly not responded to requests for comment, according to the Sacramento Bee. Depending on their performance, Thursday night’s debate could help Kashkari trounce on Brown’s 16-point lead ahead of him in a newly-released poll. Breitbart News has provided analysis of the Sacramento-based debate which will be available via live streaming on the CalChannel at 7 pm PST.